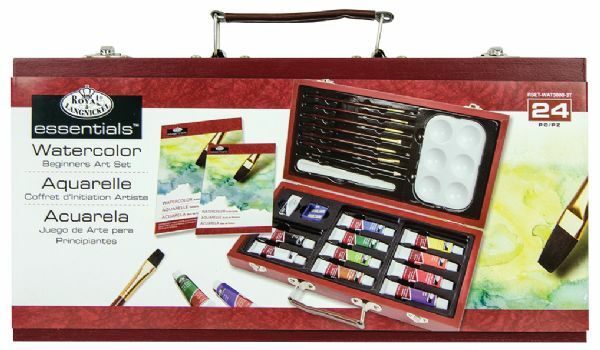 Set Includes 10 Watercolor paints 1 palette knife 6 natural hair brushes (1) 6-well palette (1) 5"x7" watercolor pad 1 drawing pencil 1 pencil sharpener 1 pencil eraser and 1 beginner guide all within convenient wooden carrying case with handle for storage and/or transport. * Colors include: Black White Lemon Yellow Green Pale Sap Green Prussian blue Ultramarine Blue Vermillion Crimson Red Lake Burnt Umber. 13" x 6.31" x 1.88"